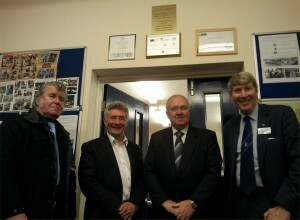 A plaque was unveiled by the Right Hon. 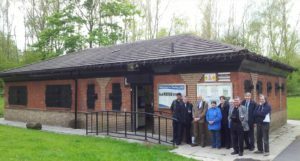 Tony Lloyd MP in front of a packed room at the Clayton Vale Visitors centre yesterday. 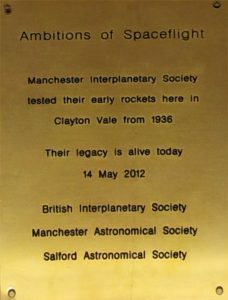 President Elect Alistair Scott from the British Interplanetary Society traveled up to Manchester to participate in this unique event to celebrate the contribution in rocket development made by the Manchester Interplanetary Society, 75 years ago. Kevin Kilburn spoke about the MIS’s founder, Eric Burgess who he last met in 1978. Burgess left the UK for the US in 1956 and was based there until his death in 2005. Other guests included Colin Rowe – a real life rocket scientist and Philip Turner, son of MIS member Harry Turner. Dave and Leslie Wright traveled up from Liverpool and members of Salford and Manchester Astronomical Society also attended. Earlier in the week, I had spoken to Eric Burgess’ daughter Janis who continues to live in California. She was delighted that this event was taking place and shared the following words about her farther. Eric Burgess was a great scientific thinker and philosopher with ideas that were ahead of his time. He was a many faceted man with a great variety of interests and hobbies. As I continue to learn more about Eric Burgess, I am increasingly aware that he was of a man of gentle quiet nature and may not have received proper recognition for all his achievements.